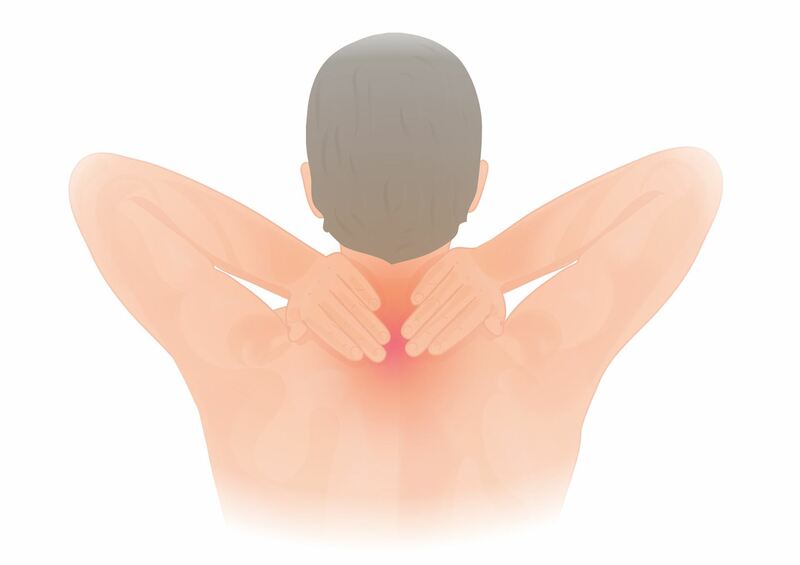 Introduction Chronic myofascial pain - or chronic pain that occurs in the musculoskeletal system when there is no obvious injury or inflammation - often defies diagnosis and treatment. Medications and commonly available physical therapies usually give only temporary relief: many patients, therefore, wander from therapist to therapist in a vain quest for relief. In this section, the nature of neuropathic pain, which is the underpinning of chronic myofascial pain, is reviewed. A peripheral neuropathy model that explains myofascial pain in a new way is introduced (7). Instead of presuming pain to be signals of tissue injury, the model blames pain on abnormal function in nerves (notably, peripheral neuropathy, when there is disturbed function in the peripheral nervous system). The model explains how pain can occur and persist without any evidence of injury or inflammation. The clinical features of peripheral neuropathic pain - sensory, motor, autonomic and trophic - are described,(10) because their identification is indispensable for diagnosis, and there are no satisfactory laboratory or imaging tests for early neuropathy. Neuropathic pain usually does not respond to medication but requires physical therapy. Commonly used physical therapies are often ineffective and a needling technique is necessary. The rationales of three needling techniques are discussed: traditional acupuncture,(2,15,20) injection of trigger points and Intramuscular Stimulation(8) (or IMS) an alternative system of diagnosis and dryneedling taught at the Multidisciplinary Pain Center, University of Washington, Seattle, and at the Institute for the Study and Treatment of Pain (ISTOP) in Vancouver). A fundamental but little known physiologic law - Cannon and Rosenblueth’s Law of Denervation1 - is cited to explain the abnormal supersensitivity that occurs with peripheral neuropathy. The crucial ingredient of myofascial pain muscle shortening from contracture (or “spasm”) is highlighted. In fact, myofascial pain does not exist without muscle shortening. Prolonged shortening not only causes pain in muscle but also physically pulls on tendons, straining them and distressing the bone and joints they act upon (9). Increased wear and tear can eventually lead to degenerative changes (e.g., “osteoarthritis”). A cardinal goal of treatment, therefore, is to release muscle shortening. The model can account for many apparently different and unrelated pain syndromes, placing them all into one classification. There may be hundreds of “conditions”, but only one underlying mechanism: radiculopathy. Medical diagnosis traditionally presumes pain to be a signal of tissue injury conveyed to the central nervous system via a healthy nervous system. The definition of pain, as given by the International Association for the Study of Pain, underscores this “an unpleasant sensory and emotional experience associated with actual or potential tissue damage, or described by the patient in terms of such damage”. But, although pain may be linked causally to tissue injury, it need not be so. Injury does not always generate pain, nor does pain always signal injury. Pain perception can arise from non-noxious input, and spurious pain can arise from within the body when there is some functional disturbance in the nervous system, i.e., neurogenic pain. (1) Ongoing nociception or inflammation. Ongoing noxious input or nociception is not a common cause of chronic pain; inflammation is easily recognized (redness, increased local temperature, swelling and inflammation) and it is usually self-limiting, unless there is some abnormal immunologic response as in rheumatoid arthritis. (2) Psychologic factors: such as a somatization disorder, depression, or operant learning processes. (3) Abnormal function in the nervous system: Neurogenic pain can arise from the CNS or PNS.3 “Neuropathic” pain refers to pain that arises when there is peripheral neuropathy (i.e., altered or abnormal function in the peripheral nervous system with or without altered structure) (7,22). “Myofascial” pain describes neuropathic pain that presents predominately in the musculoskeletal system. Although we had first used the term “pain following neuropathy”,(6) our subsequent experience has determined that the manifestations of neuropathy are almost always found in both dorsal and ventral rami of the segmental nerve, denoting radiculopathy (i.e., neuropathy at the nerve root). “Radiculopathic” pain is therefore a more accurate descriptive term. Not all physicians are familiar with the condition of peripheral neuropathy (22). It may be defined as a disease that causes disordered function in the peripheral nerve. Although sometimes associated with structural changes in the nerve, a neuropathic nerve can, deceptively, appear normal: it still conducts nerve impulses, synthesizes and releases transmitted substances and evokes action potentials and muscle contraction. When a unit is destroyed in a series of efferent neurons, an increased irritability to chemical agents develops in the isolated structure or structures, the effect being maximal in the part directly denervated. All denervated structures develop super-sensitivity (including skeletal muscle, smooth muscle, spinal neurones, sympathetic ganglia, adrenal glands, sweat glands, and brain cells). Cannon and Rosenblueth’s original work was based on total denervation and decentralization for supersensitivity to develop, accordingly, they named the phenomenon denervation supersensitivity. But it is now known that physical interruption and total denervation are not necessary any circumstance that impedes the flow of motor impulses for a period of time can rob the effector organ of its excitatory input and cause disuse supersensitivity in that organ and in associated spinal reflexes(19). The importance of disuse supersensitivity cannot be overemphasized. When a nerve malfunctions, the structures it supplies become supersensitive and will behave abnormally. These structures over-react to many forms of input, not only chemical, but physical inputs as well, including stretch and pressure. Supersensitive muscle cells can generate spontaneous electrical impulses that trigger false pain signals or provoke involuntary muscle activity(3), and supersensitive nerve fibres can become receptive to chemical transmitters at every point along their length instead of at their terminals only. Sprouting may occur, and denervated nerves are prone to accept contacts from other types of nerves including autonomic and sensory nerve fibres. Short circuits are possible between sensory and autonomic (vasomotor) nerves and may contribute to “reflex sympathetic dystrophy” or the “complex regional pain syndrome”. Disuse supersensitivity is basic and universal, yet not at all well known or credited. The important role of supersensitive structures following neuropathy or denervation has been, until recently, neglected. Many diverse pain syndromes of apparently unknown causation can be attributed to the development of hypersensitive receptor organs and supersensitivity in pain sensory pathways. It is not at all unusual for the flow of nerve impulses to be obstructed. Peripheral neuropathy, often accompanied by partial denervation, is not exceptional in adults. Of the innumerable causes of nerve damage, such as trauma, metabolic, degenerative, toxic, and other conditions, chronic attrition from spondylosis (the structural disintegration and morphologic alterations that occur in the intervertebral disc, with pathoanatomic changes in surrounding structures) is by far the most common(6). The spinal nerve root, because of its vulnerable position, is notably prone to injury from pressure, stretch, angulation, and friction. (Other causes of radiculopathy, such as arachnoiditis, neuroma, and intraspinal tumors are much less common). Spondylosis increases with age, therefore, spondylotic pain is more common in middle-aged individuals who have accumulated an “injury pool”--an accumulation of repeated major and minor injuries to a segment leading to unresolved clinical residuals which may, or may not, produce pain. Ironically, neuropathy itself contributes to degenerative conditions (including spondylosis!). Neuropathy degrades the quality of collagen, causing it to have fewer cross-links; it is therefore markedly frailer than normal collagen (14) The amount of collagen in soft and skeletal tissues is also reduced. Because collagen lends strength to ligament, tendon, cartilage, and bone, neuropathy can expedite degeneration in weight-bearing and activity-stressed parts of the body which include the spine and joints. Degenerative conditions are generally regarded as primary diseases but they are secondary to a radiculopathic process. Radiculopathic pain syndromes should therefore be treated with some urgency to delay degeneration. Ordinarily, spondylosis follows a gradual, relapsing, and remitting course that is silent, unless and until, symptoms are precipitated by an incident often so minor that it passes unnoticed by the patient. All gradations of spondylosis can exist, but early or incipient spondylotic changes, even when unsuspected, can nevertheless irritate and upset function in the segmental nerve. There is another reason for the emphasis on neuropathy acute structural deformation of a healthy nerve is not painful or only briefly so (e.g., peroneal nerve palsy or radial nerve “Saturday night palsy” are without pain), and animal experiments have shown that an acute mechanical injury to a healthy dorsal nerve root does not produce a sustained discharge unless there has been pre-existing minor chronic injury to the nerve(23). In other words, for pain to become a persistent symptom the affected fibers must have been primed with previous damage. This would explain why some people develop severe pain after an apparently minor injury and why that pain can persist beyond a “reasonable” period. These are subtle and differ from those of outright denervation (such as loss of sensation and reflexes). The effects of radiculopathy vary according to the type (sensory, motor, autonomic, or mixed) and distribution of the nerve fibres involved. In radiculopathy, symptoms and signs are projected to dermatomal, myotomal, and sclerotomal target structures supplied by the affected neural structure(10). A careful scrutiny for signs of motor, sensory and autonomic dysfunction in the skin and affected muscles is necessary Sensory Hyperpathia in skin: (e.g., when the point of a pin is drawn across skin, it is felt more sharply over affected dermatomes). Allodynia: Muscles can be tender, especially over motor points. Autonomic Vasoconstriction differentiates neuropathic pain from inflammatory pain: In neuropathic pain, affected parts are perceptibly colder. Sudomotor activity: Excessive sweating may follow painful movements. The pilomotor reflex is often hyperactive and visible as “goosebumps” in affected dermatomes. The reflex can be augmented by pressing upon a tender motor point, especially the upper trapezius. There can be interaction between pain and autonomic phenomena. A stimulus such as chilling, which excites the pilomotor response can precipitate pain; vice versa, pressure upon a tender motor point can provoke the pilomotor and sudomotor reflexes. Increased permeability in blood vessels can lead to local subcutaneous tissue edema (“neurogenic” edema or “trophedema”). This can be confirmed by the peau d’orange effect (orange-peel skin), found over affected regions by “skin rolling”, that is, by squeezing an area of skin and subcutaneous tissue. In trophedema, the skin is tight and wrinkles absent; subcutaneous tissue consistency is firmer; and the Matchstick test may be positive(10). Trophedema is non-pitting to digital pressure, but when a blunt instrument such as the end of a matchstick is used, the indentation produced is clear-cut and persists for many minutes. This simple test for neuropathy is more sensitive than electromyography. Trophic changes such as dermatomal hair loss may also accompany neuropathy. Trophic: Trophic changes may occur in skin and nails, and there may be dermatomal hair loss. Enthesopathy: Tendinous attachments to bone are often thickened. Common sites for enthesopathy: insertion of semispinalis capitis at the occiput, longissimus capitis at the mastoid process, deltoid insertion, common extensor origin at lateral epicondyle of elbow, origin of erector spinae. Motor: Muscle shortening is a fundamental feature of musculoskeletal pain syndromes and of all the structures that develop supersensitivity the most widespread and significant is striated muscle. Signs in muscle are therefore most relevant and consistent. Muscle shortening may be palpated as ropey bands in muscle. Focal areas of tenderness and pain in contractures are often referred to as “trigger points” (see Figure 1). Tender points can be found throughout the myotome and in paraspinal muscles. Muscle shortening causes a large variety of pain syndromes by its relentless pull on various structures (Figure 2) and (Table 1). Frequently, it is not pain in muscle that predominates, but pain caused by physical strain on tendons, ligaments, and joints. Because the significant changes are primarily in muscle, a knowledge of the segmental nerve supply to muscles is the clue to diagnosis. Even when symptoms appear to be in joints or tendons, it is changes in muscle that are most consistent increased muscle tone, tenderness over motor points, taut and tender, palpable contracture bands, and resultant restricted joint range. During examination, each and every constituent muscle must be palpated and its condition noted. Palpation requires detailed knowledge of anatomy, and the skill to palpate comes only with practice. Moreover, because many paraspinal muscles are compound (e.g. the longissimus) and extend throughout most of the length of the vertebral column, the entire spine must be examined even when symptoms are localized to one region. A mild stimulus can cause extreme pain. Pronounced summation and after-reaction with repetitive stimuli. “Causalgic pain”; “reflex sympathetic dystrophy” or “complex regional pain syndrome”. Local conditions are rare. Although many musculoskeletal pain syndromes appear localized to one region, e.g., “lateral epicondylitis”or “De Quervain’s disease or tenosynovitis”, examination will always reveal signs of neuropathy, especially muscle tenderness and shortening in muscles belonging to the same segment. Often, signs are found in several segments on the same side of the body, and to a lesser extent, on the contralateral side. These are generally not helpful. Thermography reveals decreased skin temperature in affected dermatomes this can be an indication of neuropathy but does not necessarily signify pain nor identify individual painful muscles. Radiculopathies are difficult to document with routine nerve conduction studies which measure only the few fastest-conducting and largest fibres and take no account of the majority of smaller fibres. In focal neuropathy, nerve conduction velocities remain within the wide range of normal values, but F-wave latency may be prolonged. Electromyography is not specific either. The goal in treatment is to desensitize supersensitivity by restoring the flow of impulses in a peripheral nerve. When the flow of impulses is briefly blocked, any supersensitivity that develops will also be transient. But when contractures and shortened muscles are present, their release is usually necessary to restore joint range and relieve pain: typically, when the several most painful contracture bands in a muscle are released, relaxation of the entire muscle follows. Contracture-release requires a physical stimulus: it does not release with medications. A physical stimulus excites receptors in skin and muscle and stimulates the target reflexively. All forms of stimuli have their specific receptors - massage and focal pressure excites tactile and pressure receptors; heat (including ultrasound) and cold activate thermal receptors; traction, exercise, or manipulation stimulate muscle proprioceptors, such as, muscle spindles and Golgi organs and so on. These stimuli are sensed by their specific receptors, transduced intro electrical signals and relayed to the spinal cord. As with the patellar reflex, stimulation reaches the affected part via a reflex. All physical and counter-irritational therapies, including acupuncture, achieve their effect by reflex-stimulation. They are effective only if the nerve to the painful part is intact. Of all the physical stimuli used for therapy, that produced by a needle is the most efficacious as it is particularly capable of releasing contractures. In this section, Intramuscular Stimulation, a needle technique based on neurophysiologic concepts will be described. Traditional acupuncture which is based on ancient philosophy, is described in another section. Acupuncture’ is a word of Western origin, coined in the 16th century to describe the Chinese use of a needle to promote healing in certain diseases. The Chinese, themselves, referred to the technique by many different names (e.g., “needle effect”, “needle skill”, or “needle therapy”) all of which emphasized the central role of the needle. In medical literature, ‘acupuncture’ can be confusing because it is used to refer to a number of related, but not necessarily identical, modalities. The actual span of any acupuncture modality’s effectiveness depends on the modality used, combined with the knowledge and skill of the practitioner. Classical or Traditional Acupuncture, which forms part of the total entity of Traditional Chinese Medicine (TCM),(20) is widely employed in China. Western medical doctors, or medical acupuncturists, who practice acupuncture in North America and Europe usually have had some training in classical acupuncture, but many of them do not apply TCM techniques, such as pulse diagnosis, or prescribe Chinese herbs, even though they continue to use TCM nomenclature and terminology(15). Most restrict their practice to pain management. They generally assume chronic pain to be ongoing signals of tissue damage (nociception or inflammation) and are preoccupied with analgesia and the suppression of nociception. When endogenous opioids were discovered, they quickly explained acupuncture as a neuro-modulating technique capable of stimulating the endogenous pain suppression system to release neurotransmitters and endogenous opioids(12). However, neurochemicals are also usually released under stressful conditions (including drug and smoking withdrawal) which do not necessarily produce pain. Their role may be to modulate various homeostatic mechanisms and act as an endocrine-endorphin stress system that complements the neuronal regulatory system. In application, acupuncture’s capability to suppress nociception is limited. Acupuncture cannot be relied on to block the perception of a noxious input, and even in China it is not a popular choice for surgery. Some medical acupuncturists call electrical stimulation with surface electrodes applied over acupuncture points ‘acupuncture’, but this is incorrect as a needle is central to the procedure. Other medical acupuncturists use acupuncture, in effect, as a form of trigger point therapy or as a means for electric stimulation. 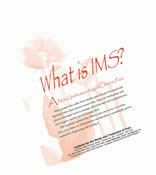 IMS is a system of dryneedling that is based on a radiculopathy model for chronic pain. Unlike acupuncture, IMS requires a medical examination and diagnosis, and it treats specific anatomic entities selected according to physical signs. Examination, diagnosis, rationale for selection of points for treatment, as well as progress of therapy are all determined according to physical signs of radiculopathy. The IMS therapist, with a sound background in anatomy and neurophysiology, is therefore much more effective than the traditional acupuncturist. IMS practitioners purposely seek out tender and tight muscle bands in affected segments for needling. Following needling, physical signs of peripheral neuropathy, such as muscle contracture (“spasm”), vasoconstriction and tenderness can disappear within seconds or minutes. (It is extremely satisfying to see these signs disappear before one’s eyes). Other signs, like trophedema may diminish more gradually, sometimes even taking days to disappear, but ultimately, all signs vanish following successful treatment. The fine, flexible, solid needle is more than a therapeutic tool, it is also a unique and powerful diagnostic instrument. Contracture is invisible to X-rays, CT scans or MRI. Contractures in deep muscles are beyond the finger’s reach and can only be discovered by probing with a needle: the fine, flexible needle transmits feed-back information on the nature and consistency of the tissues that it is penetrating. When the needle penetrates normal muscle, it meets with little hindrance; when it penetrates a contracture, there is firm resistance, and the needle is grasped by the muscle (causing the patient to feel a peculiar, cramping or grabbing sensation described by acupuncturists as the “Deqi response”). When the needle enters fibrotic tissue, there is a grating sensation (like cutting through a pear). Sometimes, the resistance of a fibrotic muscle is so intense that its hardness is mistaken for bone, and increased pressure on the needle may be required to force it in. When the needle penetrates a shortened muscle, it often provokes the muscle to fasciculate and release quickly - in seconds or minutes. A shortened muscle that is not quickly released, however, will invariably grasp the needle. The needle-grasp can be detected by the therapist when an attempt is made to withdraw the needle the grasp resists withdrawal. Leaving the grasped needle insitu for a further period (typically 10 to 30 minutes) can lead to the release of a persistent contracture. Failure of a correctly placed needle to induce needle-grasp signifies that spasm is not present and therefore not the cause of pain - in which case, the condition will not respond to this type of treatment. When there are many muscles, each with many muscle bands or fasciculi requiring treatment, it may be convenient to hasten contracture-release by augmenting the intensity of stimulation. The traditional method is to twirl the grasped needle - a motion that specifically stimulates proprioceptors. As an alternative to twirling the needle, heat (moxibustion) or electrical stimulation is sometimes used. How does twirling the needle work? as Teh Ch’i) phenomenon. This distinctive sensation is an extreme version of the muscle-ache felt in myofascial pain. Patients have variously described the sensation as ‘cramping’, or ‘grabbing’, or a ‘dull, heavy ache’. Deqi is outside any normal experience of pain, and must be experienced in person in order to fully comprehend the unmistakable quality of myofascial pain. The muscle’s grasp on the needle and the sensation the patient feels are both intensified as the needle is twirled to increase stimulation - until some moments later the shortened muscle is released with coincident disappearance of pain. Twirling the grasped needle elicits the stretch or myotatic reflex (seen clinically in the knee-jerk). The reflex is activated by the muscle stretch and causes a contraction in that same muscle. Twirling the grasped needle is like stretching the muscle: it stretches muscle spindles, causing Group-Ia fibres from the annulospiral endings to monosynaptically excite skeletomotor neurons that supply homonymous and synergist muscles. The same afferent volley disynaptically inhibits skeletomotor neurons that supply antagonist muscles. Group-Ia and group-Ib fibres work together in close association; whereas the muscle spindle signals the velocity of muscle stretch and muscle length, the Golgi tendon organ (GTO) signals the velocity of muscle tension development as well as steady tension. Group-Ib fibres from the GTO make disynaptic inhibitory connections with both homonymous and synergist skeletomotor neurons. By stipulating the needle-grasp and the Deqi phenomenon as requirements for diagnosis and treatment, TCM has perceptively recognized the central role of muscle proprioceptors in chronic neuropathic pain. Inserting a needle into normal muscle does not produce needle grasp or Deqi. A-delta and C-fibres, carriers of injury signals, are not primarily involved in chronic neuropathic pain; their stimulation produces nociception, which elicits a different reflex - the flexion or withdrawal reflex. It is important to note too that the end-product of any single spinal reflex, such as a muscle contraction, will itself initiate other reflexes. The examiner, guided by the needle-grasp and the Deqi response, is able to identify a distressed segment quickly and with greater accuracy than with X-rays, scans, or MRIs. Indeed, radiological findings can be misleading as they are not capable of distinguishing an old, non-active lesion from an ongoing, irritable one. In recurrent or chronic pain, fibrosis eventually becomes a major feature of the contracture; response to dryneedle treatment is then much less dramatic and less effective. The extent of fibrosis present is not necessarily correlated with chronologic age: scarring can occur after injury or surgery, and many older individuals have sustained less wear and tear than younger ones who have subjected their musculature to repeated physical stress. The treatment of extensive fibrotic contractures necessitates more frequent and extensive needling because release of the contracture is usually limited to the individual muscle bands needled. To relieve pain in such a muscle, it is necessary to needle all tender bands. It is rare to encounter a muscle that is totally fibrotic and cannot be released by accurate, vigorous needling. The important observation is this: when shortened muscles are released, all associated epiphenomena of peripheral neuropathy (including pain, tenderness, vasoconstriction) vanish from the treated area, sometimes from the entire segment. Simultaneous resolution of the different epiphenomena by reflex stimulation may be explained by the overlap of neuronal circuits in the periphery (where two reflexes may share the same afferent receptor population), and in the spinal cord (where the same interneuronal circuit and/or motor neuron may serve more than one reflex). For long-lasting pain relief, it is imperative to release any contracture in paraspinal muscle that is compressing a disc (see Figure 2). In such situations, IMS is effective as it is able to release the contracture and disperse any dense, fibrotic tissue entrapping a nerve root. Surgical intervention is rarely necessary as the needle can reach deeply located muscles. Requires a medical diagnosis that usually implicates spondylosis, uses neuroanatomic points that are found in a segmental pattern, instead of using traditional acupuncture points, determines the points to be treated according to physical signs. The effects of IMS appear very quickly and they can be used to monitor progress. In recent years, the injection of “trigger points” has become widely used. IMS and trigger point injection may appear to have features in common, but in fact they differ considerably in concept and therapeutic objectives. The trigger point approach regards painful points primarily as localized phenomena foci of hyper-irritable tissue (myofascial, cutaneous, fascial, ligamentous and periosteal) occurring as the result of compensatory overload, shortened range, or response to activity in other trigger points. Instead, IMS views pain as only one of several supersensitivity manifestations (motor, sensory, autonomic, trophic) that can occur with radiculopathy in muscle as well as other tissues innervated by the segmental nerve. In trigger-point therapy, saline or local anaesthetic, with or without steroids, is injected into the painful muscle. The local anaesthetic can numb the noxious source temporarily, but does not eliminated it. All too frequently, pain resurfaces when the effect of the local anesthetic has worn out. Because it is the reflex response, conveyed in efferent fibres to the affected structure that stimulates the therapeutic target, it is counterproductive to block the reflex with local anaesthetic. It produces local inflammation, the necessary prelude to healing, and generates the “current of injury” (which is discussed later). It reflexively activates other components of the segmental nerve. For example, treating the cervical spine can relieve pain in the head or hand and also produce vasodilatation in the entire arm. The fundamental purpose of IMS is to relieve any shortening in paraspinal muscle that entraps the nerve root and perpetuates pain (Figure 3). In IMS, the needle is utilized to break down any fibrotic tissue surrounding the nerve. The mechanism of neuropathic pain is different from nociception and inflammation; its diagnosis and treatment therefore call for different approaches. Diagnosis is mainly clinical because laboratory and radiological tests are unhelpful in early neuropathy. Diagnosis is by signs of neuropathy; these are different from the well-known ones of outright denervation (such as absent reflexes and loss of sensation). Signs of neuropathy are subtle but can be found if the clinician knows where to look, and what to look for. Treatment of neuropathic pain is also different - supersensitivity is soothed by the alleviation of neuropathy. Lomo has shown that supersensitivity and all the other features of denervation in muscle can be reversed by stimulating the muscle with electricity(16). Continuous electrical stimulation is able to counteract “disuse” supersensitivity and substitute for the trophic factor that is diminished or absent in neuropathy. Unfortunately, all external forms of physical stimulation have a critical drawback. They are passive, and when application is halted, stimulation ceases. Ideally, stimulation should use the body’s own bio-energy, which can be recruited in the form of the “current of injury”. First described by Galvani in 1797, this current is generated when tissue is injured, for example, following injection or dryneedling techniques including acupuncture. When the needle pierces muscle, it disrupts the cell membrane of individual muscle fibers, mechanically discharging a brief outburst of injury potentials referred to as ‘insertional activity’. Injury potentials delivered on needle insertion are able to relax a shortened muscle instantly or within minutes. Needling also induces a sympatholytic effect that spreads throughout the body segment, releasing vasoconstriction. Pain in muscles, tendons and joints caused by excessive muscle tension is eased when the shortened muscles are relaxed. Subjective improvement (which can sometimes occur within minutes) can be confirmed objectively; for example, as increase in joint range, or reduction of joint effusion; any decrease in muscle tenderness can be measured by the use of a pressure algometer. Endogenous opiates, now used to explain needling techniques, such as acupuncture, cannot account for all the observed effects. Unlike external forms of stimulation, stimulation from a needle lasts for several days until the miniature wounds heal. Needling has another unique benefit unavailable to other forms of local therapy: It delivers to the injured area the platelet-derived growth factor (PDGF) which induces deoxyribonucleic acid (DNA) synthesis and stimulates collagen formation(18). Body cells are normally exposed to a filtrate of plasmas (interstitial fluid) and would only see the platelet factor in the presence of injury, hemorrhage and blood coagulation. Chronic myofascial pain syndromes occur in the musculoskeletal system without obvious injury or inflammation. They often defy proper diagnosis because it is only possible by the recognition of neuropathic signs. They resist effective treatment because medications and commonly available physical therapies give only temporary relief. A radiculopathy model is offered to explain these syndromes. The model explains myofascial pain, not as signals of injury, but as epiphenomena or manifestations of radiculopathy when there is abnormal function in the PNS. The model allows many apparently dissimilar syndromes to be grouped under one etiologic classification (radiculopathy). Intramuscular Stimulation is an alternative system of diagnosis and dryneedling based on neurophysiologic concepts. It is directed at general practitioners, orthopedic and sports medicine physicians and others who seek an effective physical modality for the management of chronic myofascial pain. IMS is based on neurophysiologic concepts but its dryneedling technique is enhanced from traditional acupuncture. 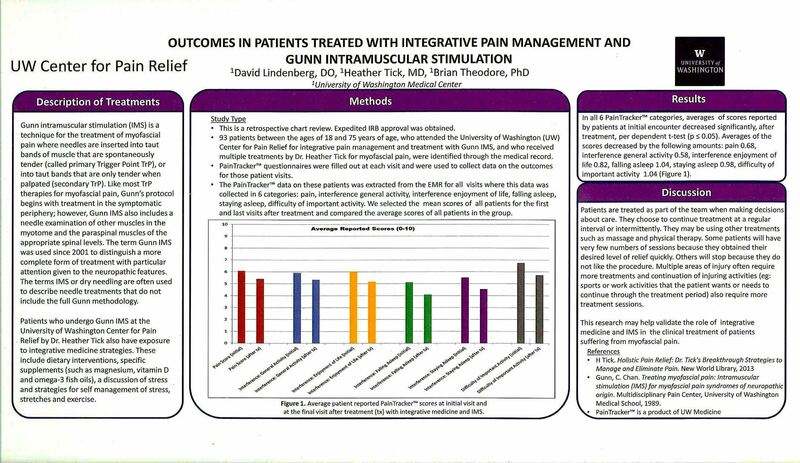 The efficacy of IMS therapy for chronic low back pain has been demonstrated by a randomized clinical trial involving a large group of patients in the British Columbia Workers’ Compensation Board. At their seven-month follow-up, the treated group was clearly and significantly better than the control group. Fibromyalgia Multisegmental (diffuse myofascial pain syndrome). Intervertebral disc Muscles acting across the disc space, e.g.,rotatores, multifidi, semispinalis. iliocostalis lumborum and thoracis, multifidi; also see 'Intervertebral disc'. Rotator cuff syndrome Supra-and infraspinati, teres minor, subscapular. Tennis elbow Brachioradialis, carpi ulnaris, extensor carpi radialis brevis and longus, ext. digitorum, anconeus, triceps. Torticollis (acute) Splenius capitis & cervicis. 1. Cannon WB Rosenblueth A. 1949 The supersensitivity of denervated structures, A law of denervation. The MacMillan Company, New York. 2. Chapman CR Gunn CC. 1990 Acupuncture in the management of pain. Edited by Bonica, Vol 2 John J. Lea and Fediger, Philadelphia. 3. Culp WJ Ochoa J 1982 Abnormal nerves and muscles as impulse generators. Oxford University Press, New York. 4. Filshie J. 1997. Medical Acupuncture: a Western Scientific Approach. Churchill Livingstone, Edinburgh. 5. Gunn CC, Ditchburn FG, King MH, Renwick GJ 1976 Acupuncture loci: A proposal for their classification according to their relationship to known neural structures. American Journal of Chinese Medicine Vol 4 2 183-195. 6. Gunn CC 1978 “Prespondylosis” and some pain syndromes following denervation supersensitivity. (1980) Spine 5:2. 7. Gunn CC 1989 Neuropathic pain: a new theory for chronic pain of intrinsic origin. Annals of the Royal College of Physicians and Surgeons of Canada Vol 22 5 327-330. 8. 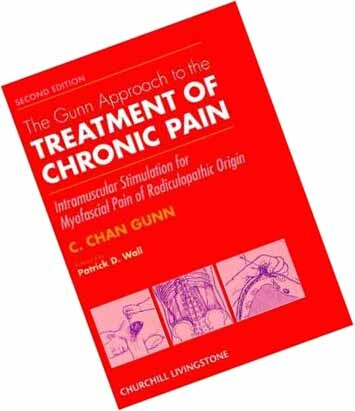 Gunn C.Chan, The Gunn Approach to the Treatment of Chronic Pain Intramuscular Stimulation (IMS) for Myofascial Syndromes of Radiculopathic Origin. Churchill Livingstone, 1996. 9. Gunn CC 1990 The mechanical manifestation of neuropathic pain. Annals of Sports Medicine 5:3. 10. Gunn CC, Milbrandt WE 1978 Early and subtle signs in low back sprain. Spine 3: 3, p. 267-281. 11. Gunn CC, Milbrandt WE 1980 Dry needling of muscle motor points for chronic low back pain. A randomized clinical trial with long-term follow-up. Spine 5: 3. 12. Han JS, Terenius L 1982 Neurochemical basis of acupuncture analgesia. Annual Review Pharmacology Toxicology 22: 193-22. 13. Jaffe LF, 1985 Extracellular current measurements with a vibrating probe, TINS December: 517-521. 14. Klein L, Dawson MH, Heiple KG 1977 Turnover of collagen in the adult rat after denervation. J Bone Jt Surgery 59A :l065-l067. 15. Lee MHM, Liao SJ 1990 Acupuncture in Physiatry, in Krusen’s Handbook of Phys Med and Rehabilitation, Fourth Edition, edited by Kottke, F J and Lehmann F, W B Saunders, Philadelphia. 16. Lomo T The role of activity in the control of membrane and contractile properties of skeletal muscle. In: S.Thesleff (Ed.) Motor Innervation of Muscle. Academic Press, New York. 289-316. 17. Mense S Nociception from skeletal muscle in relation to clinical muscle pain. Pain 54(1993) 241-289. 18. Ross R, Vogel A 1978 The platelet - derived growth factor. Cell 14.203-210. 19. Sharpless S K 1975 Supersensitivity - like phenomena in the central nervous system. Federation Proceedings 34(10):1990-1997. 20. Sivin N 1987 Traditional medicine in contemporary China. Science, Medicine, and Technology in East Asia Center for Chinese Studies, The University of Michigan. 23. Wall PD, Waxman S, Basbaum AI: Ongoing activity in peripheral nerve injury discharge. Exp Neurol 45:576- 589,1974.
by C. Chan Gunn, 1996 Churchill Livingstone. Figures and Table are used with permission.